Kray Happenings: Lincoln is 10 months old! Today, Lincoln is 10 months old! I can't believe how fast time has flown and also, when you look back at his monthly pictures over the last few months....how little he's changed! This is Lincoln's new expression when he is laughing (silently). He does it all the time! He went from sitting down to this position very quickly...and with little trouble. Time flies and Lincoln gets more and more mobile. He's still not walking, but that doesn't stop him from getting wherever he wants as quickly as he wants. The child Never. Sits. Still. He really keeps me on my toes! 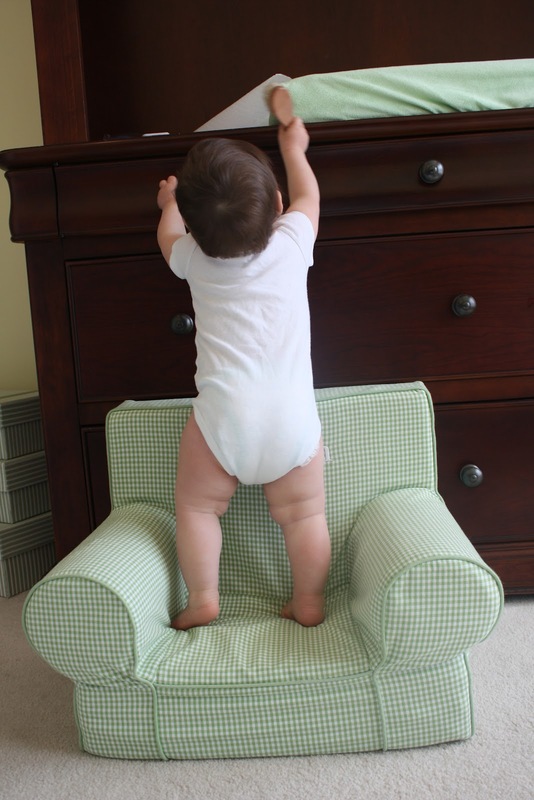 He can stand on his own for a few seconds before he gracefully sits down. He will eat anything you put in front of him (I'm sure you can tell by his adorable thunder thighs). I'm starting to give him bites of whatever I'm eating and he seems to like everything. Last month, he had just gotten one tooth and the second one came through about a week and a half later. No additional teeth yet. It's funny, I just looked and Ben had 6 teeth at 10 months! A month ago, I wrote about waving, clapping and kissing. I actually wouldn't say we are too much further with those "tricks." He does them when he wants....as a result, he often appears to make me a liar when he won't do them on command. Oh well! Whenever you ask Lincoln to say something (Mama or Dada), he clicks his tongue. He thinks this is hysterical (see silent laughing face above). Lincoln is napping and sleeping great! No complaints there. I am happy to be on a regular sleeping schedule myself...if only I could sleep past 7:30 on those occasional days that the kids do! Everything with Lincoln is going great! My only sad thing to report is that I am no longer nursing Lincoln. We were worried he wasn't getting enough milk because he was so incredibly distracted when nursing so I started pumping and bottle feeding. I planned to continue doing this, but my body had other plans. We are hoping to start giving him regular milk at 11 months so he will only have about 1 1/2 months of formula. I feel really guilty about it (Mommy guilt strikes again), but I am sure he will continue to be a healthy, growing boy regardless of the change in his milk source.